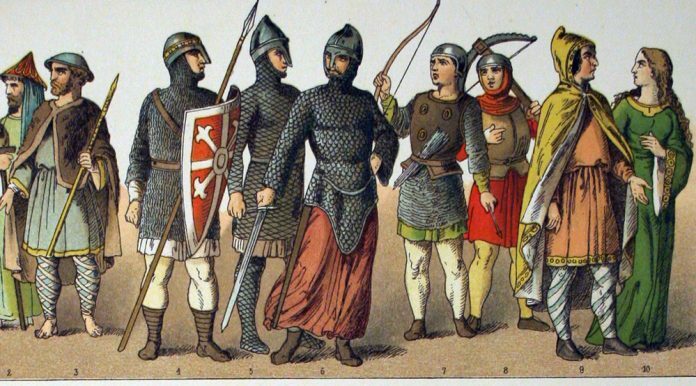 The term Normans (latin Normanni) in Middle Ages used for members of Germanic tribes that coming from the “north” especially from Scandinavia. In 8 and 9 century they formed first states in Scandinavia. On the east they were known as Varangians while in Europe usually they known as Vikings. But the term Viking is more used for those Vikings who have occupied today’s Normandy. In 793 Viking long ships landed on Holy Island off the coast of Northumbria and sacked the famous Lindisfarne monastery. By contrast, the monastery of Mont-St-Michel, also on an island, on the coast of lower Normandy, was too well-fortified to be successfully attacked. 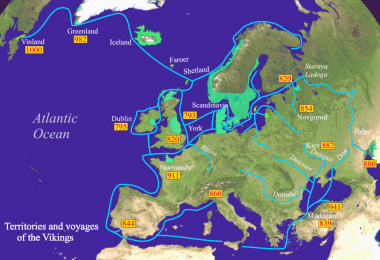 Over the next century and more, the Vikings continued to assault Britain, and traveling up the Seine, Loire and Rhone, conduits for invaders and conquerors since Neolithic period, plagued Gaul almost beyond endurance. They first appeared among the Franks in the 840s, striking swiftly, brutally and successfully. The Vikings were a pagan culture in search of movable wealth, usually precious metals, which meant they preyed on churches and towns. Both were very vulnerable. The Vikings’ great advantage in Gaul was the political confusion of the ninth century when magnates, emperors and kings quarreled constantly among themselves and could not mount any sustained, unified campaign against these northern marauders. Margrave Robert the Strong (also known as Rutpert), for example, was killed in 866 fighting the Vikings but that was chance. He spent a great deal more time at war with Charles the Bald and Louis the Stammerer, his overlord and neighbor. It was understandable, then, that Charles the Simple decided to deal with the Vikings by making them respectable. In 911 he bought off the Viking chief Rollo, known as the Ganger, by appointing him count of Rouen with a substantial grant of land to support the honor. Rollo (911-927) was the first king of Normandy. Rollo then left Charles alone, although he and his followers, at least through the reign of Rollo’s successor, William Longsword (927-942), continued to attacked Britain. Actually, attacks on Britain were often retaliation for Breton attacks on Normandy and elsewhere, and therefore part of Rollo’s obligation as a count. Meanwhile, the bishop of Coutances fled in panic from his Norman See, despite Rollo’s promise in the agreement of St-Clair-sur-Epte not to raid the church. The bishop of Rouen remained in place to oversee the Christianizing of these pagans and apparently was not molested by them. Rollo proved to be a competent administrator. So too were his successors, becoming over the next decades Christianized, pacified and, to some degree, Frankified. For himself, Rollo, who became Christian as part of the bargain, left nothing to chance and on his death bed ordered both benefactions to Christian churches and human sacrifices Ices, But his death signaled the passing of the ‘old guard’ so to speak, and his successors married Franks – for instance, Richard I of Normandy (942-996) married the daughter of Hugh the Great (duke of the Franks), thus becoming Hugh Capet’s brother-in-law – and the Normans learned to speak the local dialect. Some of them in time entered monasteries or joined the clergy, and in due course became as French as anyone else in West Francia. The duchy of Normandy, as it soon became, grew strong and rich, a duchy to be reckoned with. It was to contribute to the fragmentation of Gaul at the end of the tenth century as it became yet another powerful feudal territory quarreling with its neighbors and maintaining a great degree of autonomy. The feudal relationship was complex enough, given the weakness of those who held the Ile de France. It was to be complicated a hundredfold when one of the great Norman dukes. Williaim II, son of Duke Robert I (1027-1035), became Duke of Normandy in 1036, and in 1066 established a Norman dynasty on the throne of England. In 1077 his eldest son, Robert, wrested Normandy from him, but it was again united to England under Henry I in 1105. In 1154, Henry II, the son of Henry I’s daughter Matilda, obtained the government of England and Normandy; but in the reign of his son John, it was conquered by Philip Augustus (1203-04). It remained a part of the French monarchy for more than 200 years, but after the Battle of Agincourt (1415) it was reconquered by the English, who held it till 1449, when it was finally wrested from them by Charles VII. The Normans had begun settling in southern Italy around the beginning of the eleventh century. The Normans rapidly assimilated the Christianity and customs of the native population, and their prowess as mercenary warriors enabled them to accumulate territory, such as Aversa which was granted to them by the Duke of Naples in 1030. This permitted more immigrants to settle in the south. 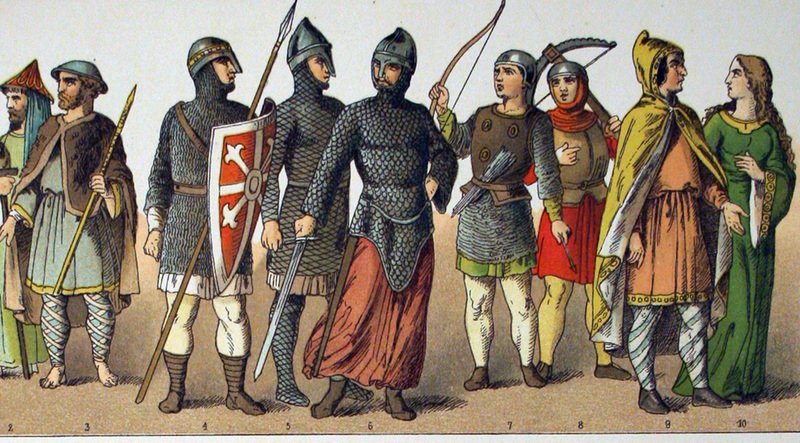 One of these was Tancred de Hauteville (980-1041) who with his twelve sons founded the Norman state in the south. One of his sons, Robert Guiscard, was primarily responsible for the capture of Calabria using an early form of guerrilla warfare. His youngest son Roger initiated the conquest of Sicily, which was then completed by his own son who was crowned King Roger II in the cathedral at Palermo in 1130. The Normans initially faced opposition from the papacy, but overcame this by defeating Pope Leo IX (1049-1054) at the Battle of Civitate in 1053, after which their control of the south was accepted and legitimized by Pope Nicholas II in 1059. They proved themselves to be remarkably able and eclectic rulers of the south. Comparatively few in number, they nevertheless retained firm but reasonably harmonious control of their territory, and ran the kingdom of Sicily, as it was now called, efficiently. Their secret, so to speak, consisted of involving in the process of government the various races who made up the population of the south, Saracens, Italians, Greeks and Frenchmen, whilst at the same time allowing each to retain much of their individual characteristics and identity. Thus, for example, the Norman fleet was run by Greeks, and the fiscal system was based on the Arab model. Superimposed on all this was an absolutist central state based on a type of feudalism imported from Normandy, with princes of various sorts holding land and position on a grant from the king. The whole resulted in a state strong enough to prevent the type of disintegration which took place in much of the rest of Italy, and also strong enough to withstand for the best part of a century challenge from both within and without, from the papacy and the empires of the East and the West. Indeed Roger II managed during his 24-year reign to conquer Malta and parts of Libya. Eclecticism is also evident in Norman architecture: the cathedral at Monreale, for example, overlooking Palermo in Sicily, is a unique blend of Greek, Arabic, French and Roman influences. Decline eventually came as the result of a succession crisis, King William II leaving no legitimate male heir on his death in 1189. This enabled the German emperor Henry VI to impose imperial rule on the kingdom of Sicily. Chibnall, Marjorie (2000), The Normans, The Peoples of Europe, Oxford. Valerio Lintner, A Traveller’s History of Italy, 2003.